A new brunch spot in a Berkeley backyard, Waffle Boss dies, and crab season winds down. Rogue may not stay in a backyard for long. 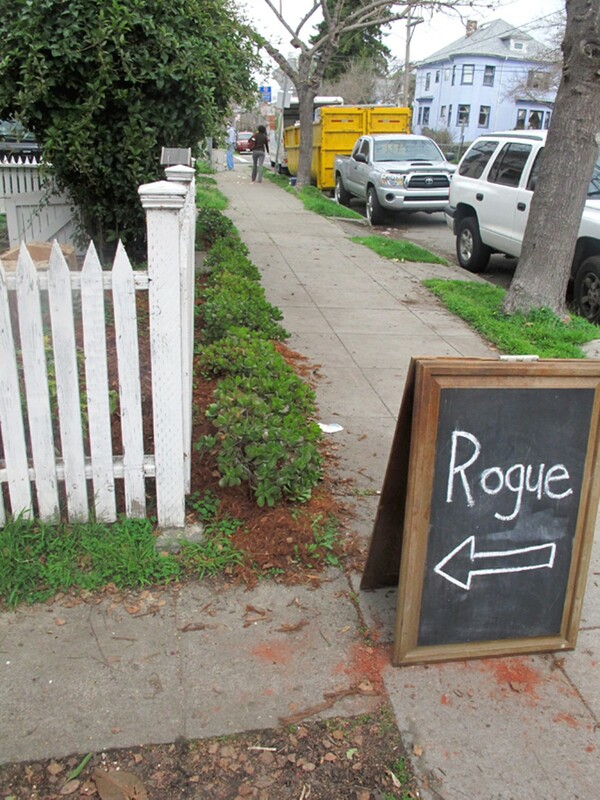 Rogue Café, a Saturday brunch spot in a Berkeley backyard, probably isn't for everybody. Your food is prepped on a propane grill, served out of a corrugated metal shed. You eat on a jumble of mismatched patio furniture, scattered among Wiffle ball bats, tricycles, and piles of cedar mulch (VIPs eat in a treehouse). You may end up chatting with strangers. Eric Thoreson, longtime barista at Pizzaiolo, launched Rogue Café in an Oakland backyard as a way to promote his other venture — One Ninety Seven Coffee roasters. Rogue customers were initially his friends and colleagues, each coughing up a small donation for the day's offerings. But the food was good, the coffee strong, and word spread fast. Friends of friends wanted in. The cafe soon moved to Ellis Street in Berkeley, at the home of Haia Sophia-Siegel. She's the flower arranger for Pizzaiolo and other local spots, and the shed was built as a workshop for her craft. Luckily, Sophia-Siegel recognized its potential as an outdoor kitchen and offered to loan it out on Saturday mornings. There's just enough space in the shed for Thoreson and his friend Ciara Sanker to maneuver about, making everything to order. They run an extension cord to the house for the waffle iron and coffee grinder. They cook on the grill, using cast-iron pans. Drinks are made with a nitrous-powered handheld espresso machine and a row of single-serve drip coffee cones. The whole setup is damn cute. On my visit, I ordered fennel sausage with arugula and currant mustard on home-baked English muffins. My friend got sourdough waffles with balsamic whipped cream, citrus, and coffee syrup. It's solid farm-to-table fare, a step above something you might get at a Berkeley potluck (plus the coffee is excellent). Expect switch-ups from week to week — they've tried everything from doughnuts to pan-seared trout and bacon on brioche. Thoreson is casually scouting for a permanent location, but isn't in a rush. For now he's fine keeping it a sun-sweetened Saturday experience (possibly Sundays in the future). People are kind, there's plenty of space to spread out, and you can stay as long as you like. Oh, Thoreson and Sanker are always curious how newbies have heard of Rogue Café; tell them the Express sent you. 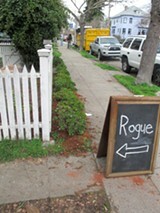 3204 Ellis Street, Berkeley, 510-520-6782, Facebook.com/roguecafe. Open Saturdays, 10-1. Last week I noticed that Waffle Boss, the Liège-style waffle shop that was supposed to open in Temescal by the end of 2011, had not materialized. The shop's website and Facebook pages were down, and an Internet search turned up nothing on owner Peter Fikaris. So I wrote a blog post with the words "Waffle Boss where art thou?" Three days later, I got an email from the boss himself. Sad news for waffle lovers: After two years trying to get Waffle Boss running (obtaining permits, building out the space, etc. ), Fikaris has given up. He sold his waffle maker to San Francisco chicken-and-waffle pop-up Angry Man Eats. He's also leasing out the Waffle Boss location (4140 Telegraph Ave.) to the owner of Rico's, who plans to open an offshoot of the popular downtown diner. Now Fikaris has his hands full with a new project, Pretty Dog Hot Sauce. It sprang from his attempts to create a spicy sauce for chicken and waffles, and has now spread to seven varieties. Using the kitchen at Addie's Pizza Pie (where Fikaris works), he's concocted an eclectic range of flavors like black garlic with Meyer lemon and habanero blood orange. Pretty Dog sauces are currently offered at Addie's, Remedy Coffee, 24th Street Cheese, Rico's Diner, Zza's Trattoria, and soon-to-open Beauty's Bagel Shop. Fikaris hopes to have it permitted soon for retail. But is he sad about giving up his waffle dreams? "Not at all," he laughed, "though my friends are now obsessed with waffles." The Dungeness crab season ran a little short this year, after a strike in November paralyzed the industry for weeks. We're now approaching the end of season, but luckily there are still a few local options for Dungeness meals. Camino (3917 Grand Ave., Oakland, 510-547-5035) is hosting a season finale feast on Monday, February 27. Thirty-five bucks nets you half a Dungeness crab, grilled in the fireplace and served with kimchi and farro. For $12, you can get an extra half crab. Origen (2826 Telegraph Ave., Berkeley, 510-848-9200) is serving a Moroccan-style b'stilla seafood pie with shrimp, Dungeness crab, and Asian seabass; glass noodles; and saffron custard until February 26. Ajanta (1888 Solano Ave., Berkeley, 510-526-4373) will have Dungeness crab cakes on the menu until February 29, spiced with whole black cumin seeds, dried pomegranate seed powder, and chili flakes. Seafood shops like Hapuku (5655 College Ave, Oakland, 510-250-6007) in Rockridge still have raw crabs but call before you visit — supplies are dwindling. A new independent movie filmed at Oakland sushi restaurants explores adversity in life and in the kitchen. Our guide to the best spicy drinks in the East Bay.